Gorgeous DIY Leather Tassels - Gift Them to Everyone You Know! This post is brought to you by Cricut Explore Air™ 2. Check out their amazing 12 Days of Christmas sales happening right now, with Cricut machines as low as $139.99 — these prices won’t last long! Here’s a gift idea I know you’ll love. These DIY leather tassels are so easy to put together, and they look gorgeous! Hang a few from your handbag or tote, use them as keychains, or top off a gift with one — wherever you put them, they’ll for sure add a big dose style and sophistication. 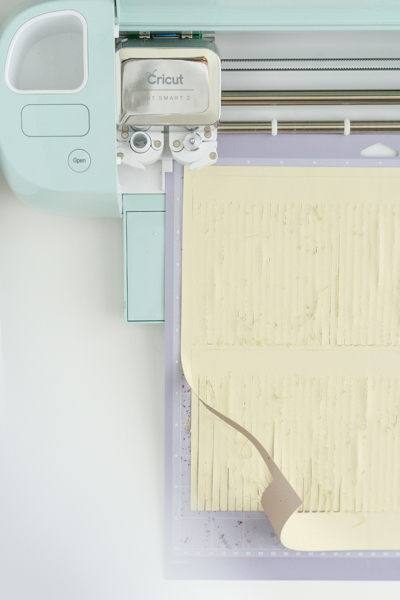 Amy Christie and I were thinking of gift ideas that kids can really make — useable projects that look legit — and realized that with the Cricut Explore Air 2, making tassels is suddenly easy as pie, even for kids. Because all the cutting is done for you! And with Cricut, the cuts are totally precise, so the tassels really look fabulous — your kids will want to make them for their piano teacher, their coach, their favorite aunt. Your teens will want to make them for everybody they know. But fair warning, they’re so pretty you may want to keep them all to yourself! I have owned a Cricut for ages — I had one of the first generation machines and I’ve upgraded over the years. I have used Cricut with paper, with vinyl, with iron-on material, with chipboard, and on and on. But I have never used it with leather. Until now. And after seeing such success with this project, I’m not sure why I haven’t tried using Cricut for leather before! Well, now I’ve done it and wow is it slick! I’ve tried leather projects with the rotary cutters and the rulers and by the end, I’m sweating, my hands are hurting and I’m frustrated. Using the Cricut, all I have to do is push the cut button and watch while the magic happens! 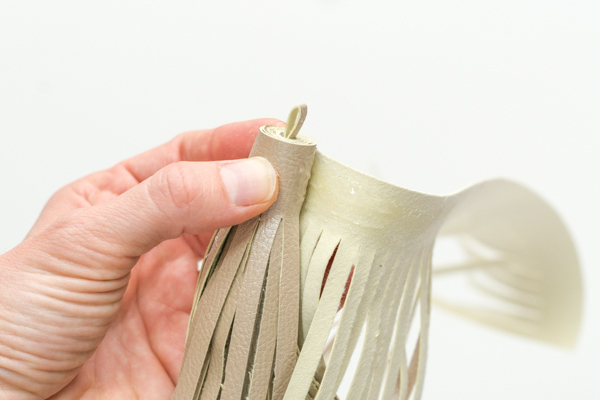 These DIY leather tassels, with the help of the Cricut Explore Air 2, are easy peasy to make. My children loved choosing colors, loading and unloading the mat, pressing the cut button, and pulling the leather from the mat. I did the gluing (my kids are little, older kids could do it themselves) but as soon as that was complete, they chose the color bands and extra charms. I hope their teachers enjoy them! – 12″ x 12″ leather*, plus a smidge more for the loop. We used Faux Leather from Cricut. Download the tassel shape and add it to the Cricut Design Space. Resize the shape by going to the edit panel. The fringe piece should be about 11.5″ wide by 5″ high. Unlock the dimensions so you can individually alter each size. Additionally, make a rectangle .25″ wide by 11″ wide for the loop. Lay the leather face down on the strong grip mat and have the Cricut machine cut two fringe shapes and one rectangle. To make the tassel, fold the loop piece in half. About an inch down, add a bit of glue between the two halves. Lay out one of the pieces of fringed leather, face down. Spread a layer of glue across the unfringed section. Place the loop piece at the far left edge of the fringe piece making sure the loop hangs over the edge about 3/8″ (at least) then start rolling it up. Roll it up completely. 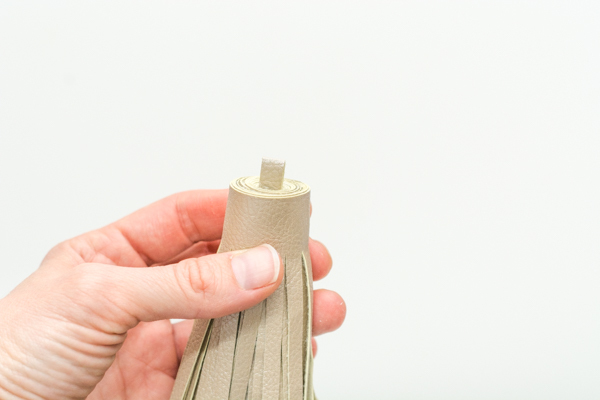 Add a layer of glue to the second piece of fringe and add it to the tassel roll, rolling it up completely. 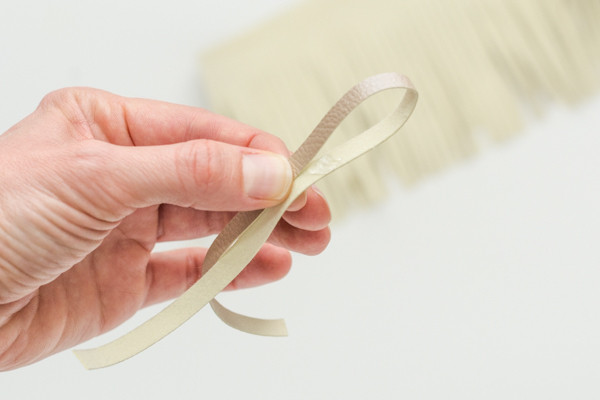 If you want to add a band or two of color, you can use the loop shape again or cut it one out any width you’d like. Coat the backside of the band with glue and add to the top of the tassel as you wish. So cute, right? Are you loving tassels as much as I do? Don’t you just want to make a dozen of them? DIY leather tassels for everybody! If you give this project a try, I hope you’ll let me know. I love when readers send pics of the Design Mom projects they’ve made. It’s the best! Interested in getting a Cricut for yourself? 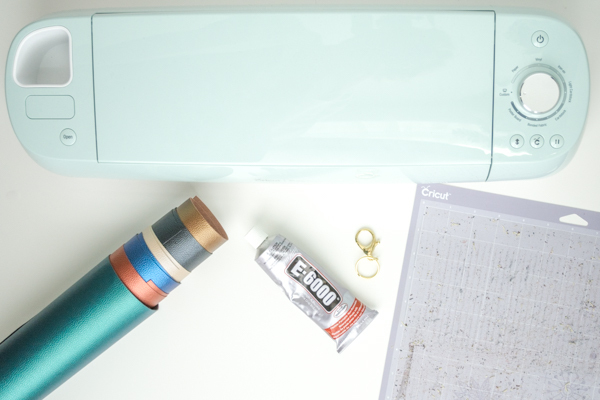 I recommend the Cricut Explore Air™ Machine + EVERYTHING Starter Set. You get the gorgeous machine, plus all the tools and materials that will be most helpful. And it makes a really good gift. Cricut has some amazing sales going on for their 12 Days of Christmas promotion with machines as low as $139.99! Use code “FREESHIPDEC” by 12/16/2016 to receive your order by Christmas. Credits: Images and styling by Amy Christie. These are so cute! Such a great stocking stuffer idea! Aren’t they the best? I’m thinking someone needs to use their Cricut to open up an etsy shop full of tassels. Amazing, but I’m having a hard time figuring out how to download the tassel file. I can’t seem to get the tassel either! Has anyone found the tassel file to download? I can’t find it. Been wanting to make a tassel for a long time. I just picked up some faux leather from downtown over the weekend. So I think I’ll be making these for Christmas this year. Thanks so much for the tutorial!